As lawmakers prepare to hear new testimony from fired FBI Director James Comey during Thursday's Senate Intelligence Committee hearing, the nation's watering holes are looking to capitalize on his much-anticipated appearance before Congress. Bars across the country are opening their doors early to serve politically-themed cocktails to those looking for a place to watch the hearing live. Comey is expected to provide details on memos he wrote after each of the nine one-on-one conversations he had with President Trump. In one, notably, the president asked him to drop the FBI investigation of Michael Flynn just after Flynn had been forced to resign his position as national security adviser. Flynn had misled the vice president and others about what he had discussed in his contacts with Russian Envoy Sergey Kislyak. 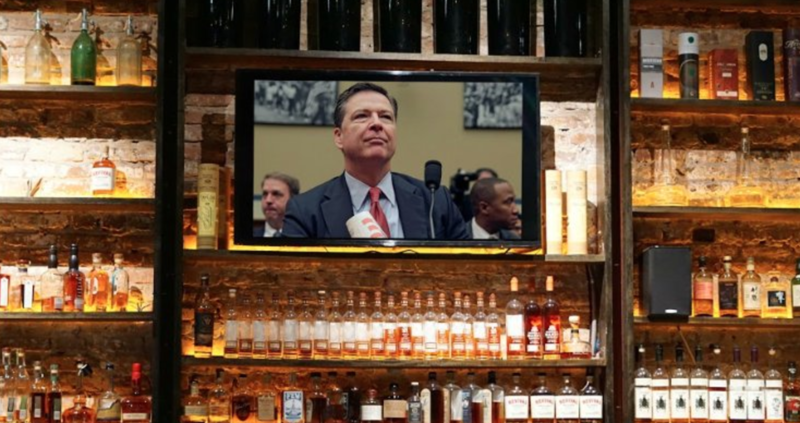 The bar in Washington, D.C.'s Shaw neighborhood is serving Russian vodka cocktails and an "FBI breakfast" bright and early at 9:30 am for their "Comey Hearing Covefe" event where the bar will broadcast the hearing. Shaw's Tavern General Manager Rob Heim told CBS News, "We have always had watch parties for debate nights and on election nights -- but this will certainly be our first watch party for a congressional hearing." The Capitol Hill pub will open at 9:30 a.m. and will buy a round of drinks for the house every time President Trump issues a tweet on the hearing, offering the generous special until Comey's testimony ends. Ashley Saunders, Union Pub's general manager tells CBS News, "We've held political events in the past, however, this is the first time we're doing something of this nature. Generally we have drinking games set out on the tables, but this will be the first time we are offering free rounds for tweets. We are very excited." Saunders adds, "We wanted to do something different. A lot of bars in the area are participating in the viewing of the hearing as well as offering specials, and we wanted to go above and beyond to stand out. We want to show our customers to a good time, do something different, and allow our staff to have fun all in the process." The part-restaurant, part-butcher shop will be opening at 10 a.m., and offering breakfast service. Specialty drinks: "The Last Word" and "Drop The Bomb"
The pub will be hosting its own "Comey Show" -- doors open early, and the pub offers free WiFi to allow patrons to "work" while viewing the proceedings on any of 15 television screens. West Coast establishments plan to open substantially earlier than East Coast bars, since the hearing's 10 a.m. ET start time translates into 7 a.m. PT. Bars like Ace's, Gino and Carlo's Tavern and Clooney's Pub will have their TVs tuned to the testimony. The bar will be opening its doors promptly at 8:45 a.m. for early morning beers and friendly debate at their "SUPER BOWL OF Washington" event. While the event boasts a whopping 120 RSVP's and 906 "interested" attendees on Facebook, Axelrad partners Adam Brackman, Monte Large, and Jeff Kaplan tells CBS News this is far from their first rodeo. "Axelrad has set out to activate the community and be an advocate for causes that align with our values. We have hosted watch parties for all debates where over a thousand people showed up, organized an event with the ACLU that featured music and musicians from countries listed on the travel ban and donate to causes. Throughout the election, we had a voter registration booth on site to encourage young Houstonians too be more active and engage in politics. Around 500 people registered to vote!" The partners added, "We see ourselves doing our part to further the engagement of younger people who have not typically been engaged in politics, and acting as a community gathering place from people of all walks of life. We welcome people no matter what their political beliefs, but want to encourage people to be more engaged in our community." Specialty drinks: "Impeachmint", "Bad hombre", "Paid Protester" and "Frozen Covfefe"